Here's an interesting follow-up to yesterday's story about Android 6.0 Marshmallow on the Yotaphone. This notice is being interpreted by some to mean that the Yotaphone 3 is coming this summer, and they might be right. When we last heard rumblings of a new Yotaphone in the form of an Instagram post several weeks ago, I discounted the report because the source was unverified and the evidence was thin. Later news reports which said that the Yota Devices's parent company had killed the Yotaphone 3 by declining to invest capital in the project cast further doubt on the story, but now that we have the pre-order teaser we have to wonder whether independent financing has been found. There's still not enough evidence that the Yotaphone 3 is coming, but the possibility can no longer be discounted. But I am still not convinced. The last Yotaphone was released just over two years ago, and it was so successful that less than a year later parent company Yota Devices sold itself to a Hong Kong investment company for $100 million. Yota Devices moved its operations to China, and the remaining Yotaphone 2 stock was sold off at clearance prices. 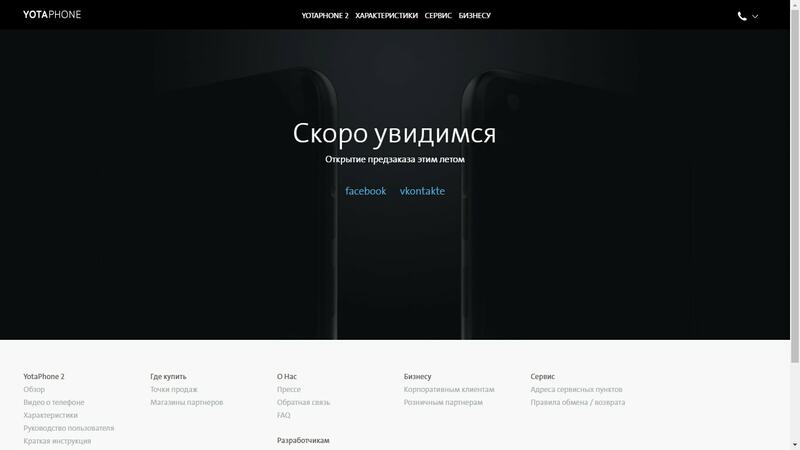 And now Yota Devices's Russian staff plans to release a new phone - without the support of Yota Devices's primary stockholder? It's not impossible, but it sure is implausible. Thanks, Vikarti, for the tip! Yes, it looks like my sources were wrong.